I suppose if you are in Colorado, you know what’s going on. If not, well, check the news. 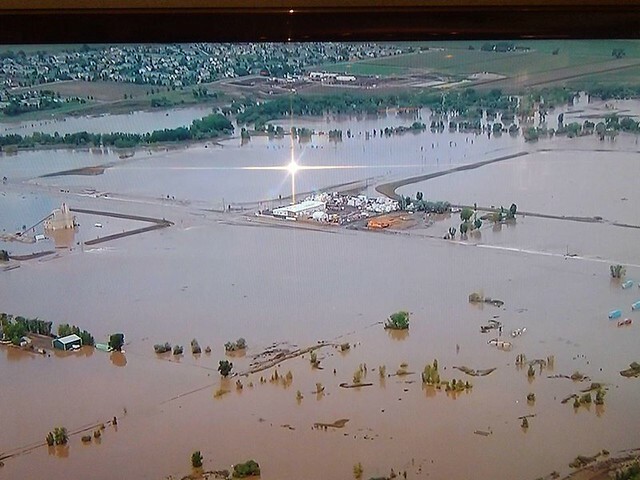 Colorado is flooding and we are in the center of it. It started raining steadily a few days ago and never stopped. My front lawn had that super mush feeling when I walked across it. The curbs were overflowing. Our neighborhood was dealing just fine but the raging waters were building to the west. The rain dumped on the foothills heavy and we got about a year’s worth of rain overnight. This caused flash floods. iPhones were going off with weather alerts and the news went to constant updates. The Facebook updates got crazier and crazier as every river and creek going east rose to “major” flood levels. Roads started getting tore apart. It was reminiscent of the scenes from New Orleans in places but it was here. Most of the roads into our town were shutdown this morning as the rivers cross east to west breaking the city in half. 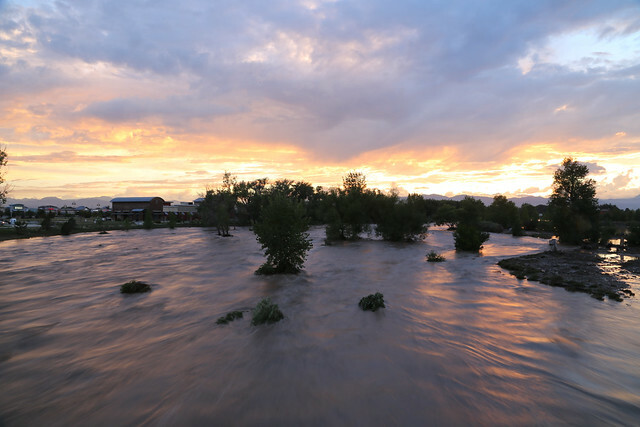 We live right along the St. Vrain river and its roaring. That’s a picture of it above out by Best Buy in our town. There is a nice tall bridge there installed about 5 years ago. The river is actually nearly cross-able on foot on a low day. I run along it a lot. Now its taking the entire underpass up. Back towards home, we had new helicopters up above. We live along Colorado 119 which is a big highway that goes through Longmont. It was closed as of yesterday at the turn to our neighborhood. My neighbor, Jenn, got this pic off the TV. Our houses are the ones at the top of the frame. That’s our cow farm just below it — you’ve seen if it you have been here. So this is kind of SE of our house looking NW. 119 is running right down through the center from left to right in the pictures. Totally underwater. That lake right to the left and below the cow farm is usually a nice walking path with define lakes. Now its a massive wetland. More of the lakes. This area is always wet so its not terrible through here. 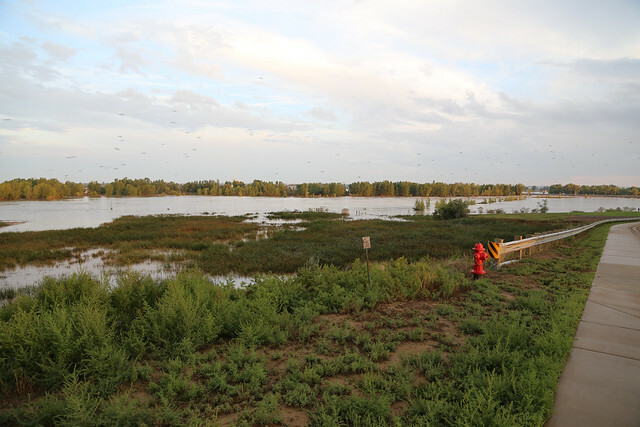 Lots of nests and wildlife though that had to move to higher ground. Driving back into our neighborhood. Looking east out to I-25. Water as far as you can see. 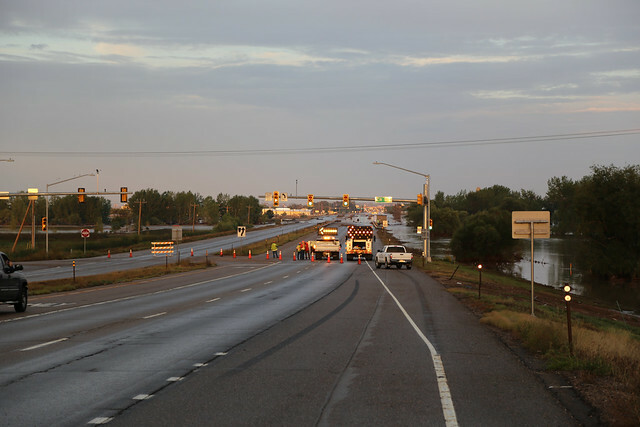 I-25 is closed where this water crosses too. Basically you can’t drive from Denver to Wyoming as there are several stretches of Interstate flooded as the water escapes east. As for us, our house is fine. We lost potable water today for about 12 hours but its back on now. Power flickered but never went out. We are up nice and high so its just a perch to watch the craziness around us. 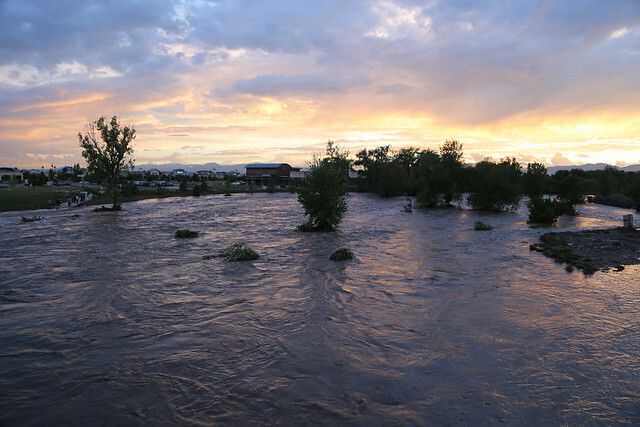 There are areas far worse than our little corner but Longmont is on the top of the news with Lyons, Estes Park, and Boulder for getting the brunt of this. 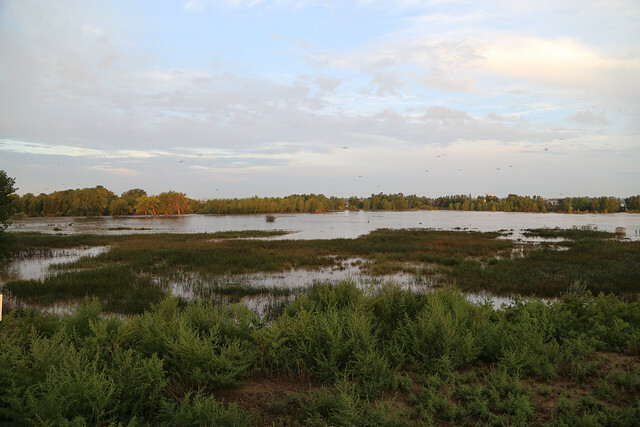 Weld County itself is a mess as the water gets east and is just flooding farmlands for miles. Its supposed to rain all weekend. Then the storm is gone. Some said this was the 100 year flood we always here about. The paper is saying maybe 500 year. All I know is that I haven’t ever seen anything like this in person. Water is powerful. A local guy did some video from a helicopter…this is some of the same area I photographed above.